Order beef, chicken, and the occasional package of bacon from a local farmer about an hour away. Order from a food co-cop, Azure Standard, which delivers once per month. Get several dozen eggs each week from a man from church who raises chickens just out of town. Get milk once each week from a family who raises animals in a nearby town. Order one lamb per year from the same family who provides us with milk. Buy from the farmer’s market and grow/preserve our own produce during the summer. And occasionally, when I’m in the city, I’ll shop at their bigger health food stores or regular grocery stores. Um, hi. I have a dozen grocery purchasing sources. I really never considered how many different ways I have found for saving money and purchasing the best food I can get my hands on at the best prices. Your food sources are going to look completely different from many of mine simply because of your location and options. My tip for you today is to think outside the box and find the sources that will work best for you as you find wholesome, nourishing food for your family! There are sources out there, you just have to find them. And if you’re in the U.S. I encourage you to look into the online resources I mentioned above. Online grocery shopping rocks! You should know that our source for farm-fresh eggs has changed something like five times during the past nine years. I share that to encourage you that if one source falls through, ask around and search for another source! Leave a comment and let us know where you grocery shop! Do you like shopping online? Your options look a lot like mine!!! I didn’t realize how many places I rely on until I started telling someone. ???? but it works and I enjoy every but of it!! Well, 80% of my shopping is at Aldi, and then the rest is probably Trader Joe’s, and then occasionally I add in the cheap grocery store near me for bananas at $0.22/lb, and sometimes the expensive grocery store near me for random other things. And then in the summer I trade baked goods for backyard chicken eggs. Eggs and the majority of my meat(beef, pork, lamb and whole chickens) come from the farmer’s market year round as well as the bulk of my produce when in season. I buy organic butter and BGH free cheese (can’t afford organic) at Trader Joe’s, along with preservative free breads, organic free range chicken, wild caught salmon, produce and some whole food pantry items. The rest is bought at a local large grocery store, because their produce (and everything else) is really cheap and last week I spent $83 in produce. They also carry a local brand of organic milk/whipping cream that is REGULAR, not ultra-pasteurized for the cheapest price in town and have a large natural foods section. Sounds crazy to most people, but I do what I have to feed my family healthy food. I do 90 percent of my shopping at Publix!!! I do some shopping at the Whole Foods Store. I have gotten a few items from on-line sources, I would like to do more on-line shopping. I have gotten from Tropical Traditions. I would love to try Amazon. I live in Davenport Florida and would love to get into a co-op. Can you suggest one for my area or give me some I can research? I also love going to the Farmer Market!!! I would love to get fresh eggs!!! If you’re looking for grain, dry beans, and other non-perishable baking ingredients, there are lots of Breadbecker co-ops in Fla. They give a big discount when you buy in bulk, and being part of a co-op reduces shipping costs. Here is the link: http://info.breadbeckers.com/co-op-locations/. I live in a City with a two grocery stores on the same block just 3 minutes away from home – – but I still shop like you! If anyone struggles with this, the best tip I got was to start keeping a shopping journal. Not just to write down prices, but notes about the quality, selection, special dietary offerings, customer service or whatever else is important to you as a consumer. After you journal your shopping experiences you’ll start to see trends and get a sense of which items you buy from where and it’ll become second nature. I started doing this all over again with online shopping – I read so many blogs and there’s so many options out there I started keeping notes about which sites had the best deals, the best shipping prices, return policies, etc. Do any of you have access to an online produce service (co-op) called Bountiful Baskets? I am feeding a family of 6 (two teen boys) and this is such a blessing! Each basket is only $15 and they offer extras such as, WW organic bread (5 loaves/$12), virgin organic coconut oil, granola, juicing packs, cases of fruits and vegetables, etc. I would encourage you all to check for this co-op in your area by going to bountifulbaskets.org. 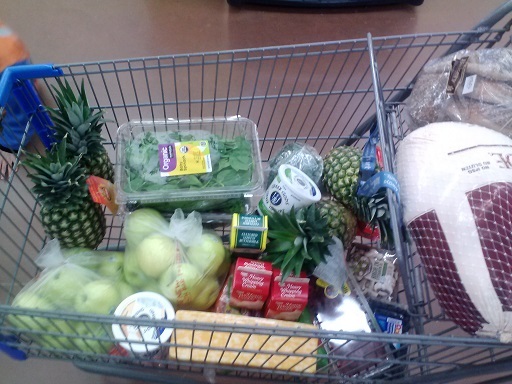 I have friends w/ larger families who order 2 baskets and still spend under $50 for a TON of fresh produce. I LOVE online shopping! I order food through Amazon’s Subscribe and Save and their Prime Pantry (although I am new to this and still figuring out if it saves me money). There is a Safeway down the street that is convenient and an international market that is inexpensive. The biggest thing I learned is to ask others how they feed their family, Everyone has something to share. I especially take note when someone feeds a large family well. I have given up on Walmart for this season of life, It is a little too far for me. Thanks for encouraging us on our healthy eating journeys! I order in bulk from Azure Standard 3 – 4 times a year. I usually purchase beans, lentils, wheat berries, rolled oats, sucanat, apples and other fruits, from them. The vast majority of our food comes from Trader Joe’s. Produce, a few packs of lunch meat, organic hot dogs, many varieties of cheese, organic juices, frozen veggies, dried fruit, nuts, Kerrygold butter, cream, sour cream, and the list goes on! We purchase bread, some produce, and a few other items at Whole Foods. I do order some things from Amazon, and I also order from Tropical Traditions. Once every year or two, I order 2 gallons of olive oil from Chaffin Family Orchards. I LOVE their olive oil! I also place an order or two per year from US Wellness for Polish sausage, Italian sausage, and Bratwurst. We love all our good food!